1819 Spain sells its colony in Florida to the USA. The Prado opens as a museum of art. Beethoven composes his Missa Solemnis. 1819 Goya paints altarpieces. First attempts at the new technique of lithography. Severely ill towards the end of the year. 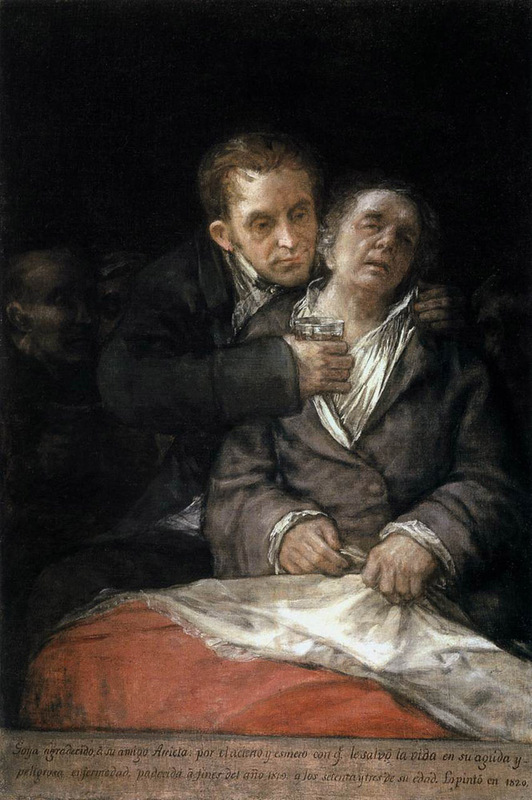 1820 The 73-year-old Goya survives the illness and paints Self-Portrait with Doctor Arrieta. During the course of this year, he paints large-format frescoes, the so-called "Black Paintings," in his house. 1821 Puts finishing touches to Disasters of War series of prints, in addition to work on the so-called Disparates. 1821 Birth of the writers Charles Baudelaire, Feodor Dostoyevsky, and Gustave Flaubert. 1822 The Vatican accepts the Copernican (heliocentric) view of the universe. 1823 Goya gives his country house to his 17-year-old grandson Mariano. Leocadia Weiss, a liberal, goes into hiding because of increasing political persecution in Spain. 1824 End of Spanish colonial rule in South America. In 1819 Goya bought a small country house outside Madrid, where he could live with his young companion, Leocadia Weiss, far from the bustle and gossip of the city. In the same year he became so ill that he nearly died. After his recovery, he retired almost completely from public life and worked mainly for himself, thus freeing himself from having to take account of public expectations. In addition to the frescoes he painted in his house, known as "the House of the Deaf Man," he created a series of strange, absurd etchings. It was not until the Surrealists of the 20th century that artists were to draw so heavily on their own fantasies and dreams. 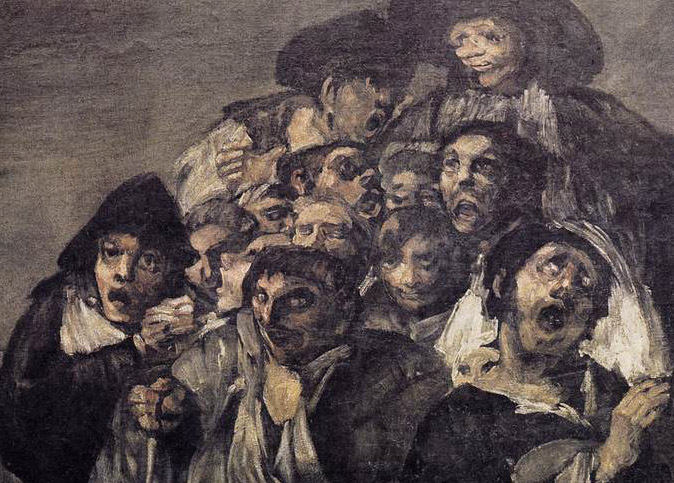 Goya's images, however, are also a reflection of dramatic, radical political change. After the apparent victory of the supporters of reform in the uprising of 1820, the purges of the Inquisition and the secret police recommenced. "The House of the Deaf Man"
In the long dedication at the lower edge of the painting Goya records his thanks to the doctor who cared for him during his dangerous illness. The self-portrait shows the mortally ill painter helpless in the arms of the solicitous doctor, who is in the act of giving him medicine. 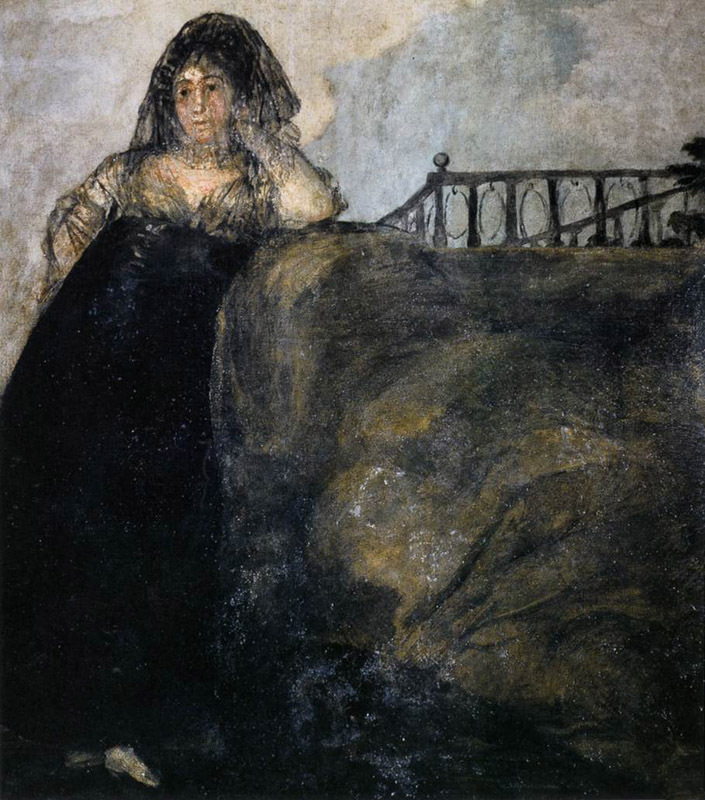 Goya painted on the walls of his house after his recovery. The color is so thin in places that the canvas is visible. 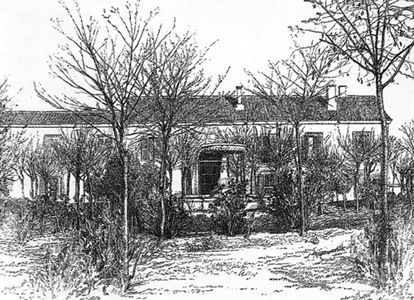 The country house which Goya bought in 1819 for 60,000 reales lay outside Madrid, on the banks of the Manzanares, and was soon called Quinta del Sordo, "the House of the Deaf Man." 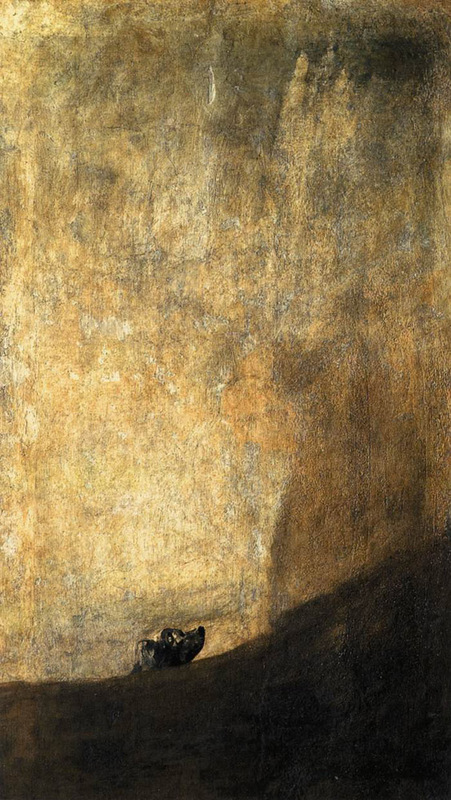 Goya had reason enough, private and political, to flee city life. Under the disapproving eyes of his relatives, the young Leocadia Weiss had become his companion after the death of his wife. She was separated from her husband and made no secret of her liberal politics. She and her small daughter Rosario moved into the Quinta del Sordo with Goya. In the two largest rooms of the house, Goya painted his last major series of pictures: 14 frescoes called the "Black Paintings" because of their predominantly dark colors and somber themes. They were painted in oils directly onto the walls. In the late 19th century they were detached from the walls and transferred to canvas. 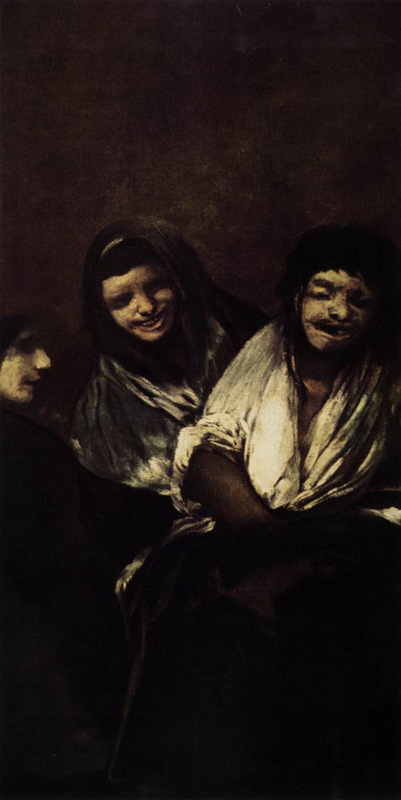 The Black Paintings belong to Goya's most enigmatic and oppressive works. One of the paintings shows an outlandish procession of pilgrims in a dark mountain landscape; and another, two men in a desolate landscape fighting with cudgels while sinking into quicksand. Then again, we make out figures hovering indistinctly in the air as in the painting Vision (Asmodea). In these paintings dark forces, fanaticism, violence and fear hold sway. 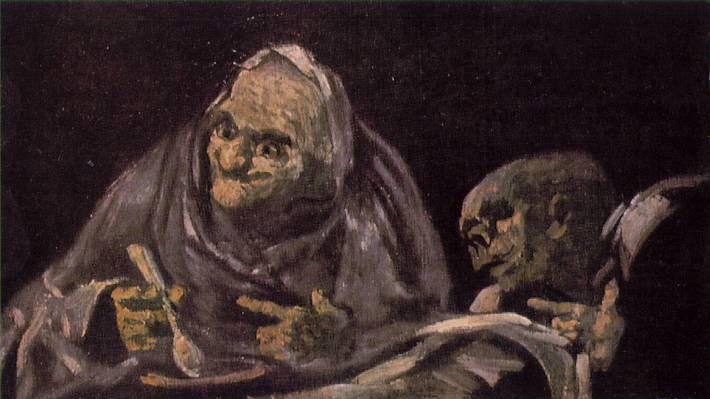 These oppressive visions give a vivid impression of Goya's fears and reveal him to be a lonely, deaf old man who had withdrawn into a deeply depressive and critical view of life. 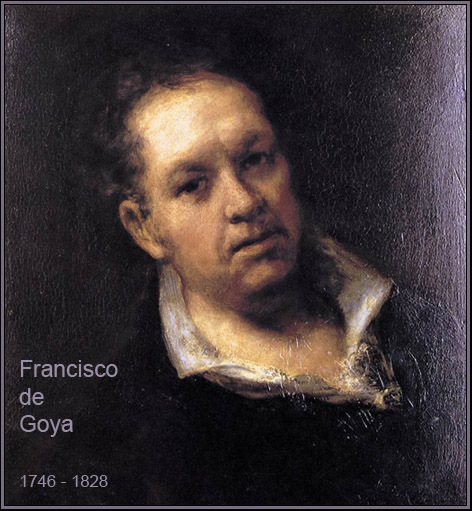 The Spanish author Ortega y Gasset (1883-1955) wrote of Goya's work: "Is what we see good or bad? Does it mean what we think it does, or exactly the opposite? Is its effect an expression of the artist's wish, or does what he paints come into existence independently of his will? In a word, is he a highly significant genius or a madman?" 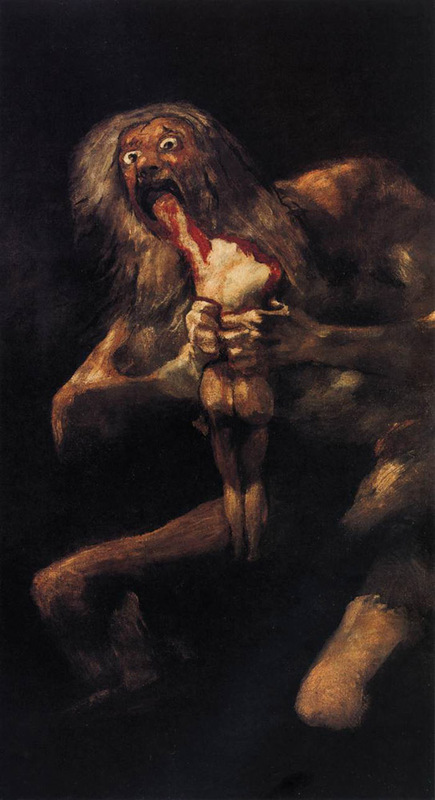 In many of the Black Paintings Goya adopted mythological or biblical scenes which, as with his subjective visions, he represented as oppressive nightmares, as with Saturn Devouring His Children. Another painting shows the biblical figure of Judith slaying Holofernes. One single painting radiates peace and possible reconciliation: the painting of Leocadia Weiss. Well overfour meters (about 14.4 feet) wide, this painting was also given the title Witches' Sabbath. painting: to the far right a young woman is sitting a little to one side of the gathering of witch-like creatures. She is looking distantly at the crowd swarming around the great goat. here its figure is seen as a black silhouette, its head emerging from the wide drapes that cover its body. gray, and brown, with here and there a gleam of white shining from the eyes of the figures. Every object seems to merge together and blend with the somber background into indistinct clusters. 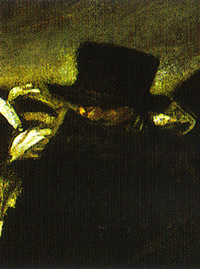 Goya's companion looks thoughtfully from the painting. is leaning on a rock that could also be a burial mound; above her is an open blue sky.